Pray the Rosary every day, in order to obtain peace for the world, and the end of the war. 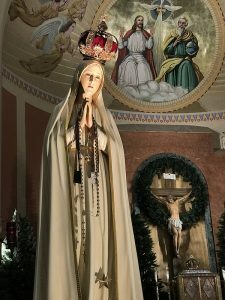 These were the words of Our Lady on May 13, 1917 to the three children in Fatima. One hundred years later, her command is still relevant. The Nugents, a local family from St. Catherine’s of Sienna parish in Wake Forest, started making simple mission rosaries years ago. The youngest children would string the beads until they were old enough to join their older siblings in knotting the cords. Eventually, Mr. Nugent tried his hand at making chain link rosaries and they branched out into repairing rosaries for friends. Then, a friend asked if they could make a personalized rosary. That request was the catalyst for Divine Decades, an Etsy shop. Now this devoted Catholic family continues making rosaries together which are available for purchase. 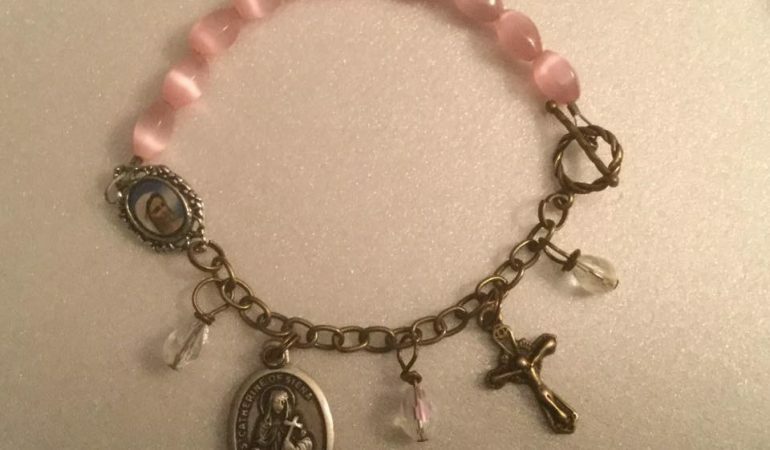 Since that first request for a personalized rosary, Divine Decades has added decade bracelets and Seven Sorrows chaplets. 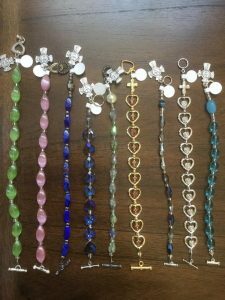 They are also willing to make custom rosaries and prayer jewelry designs based on customer requests. A personalized rosary is the perfect gift for a first communicant. Replace the chocolate Easter bunny in a child’s basket with a chaplet bracelet in their favorite color. Let a special woman know she’s loved with a double heart decade bracelet for Mother’s Day. 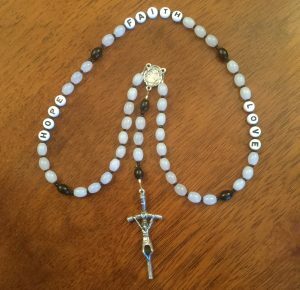 Divine Decades is giving away a beautiful, hand-made rosary to one lucky (and very blessed) winner. The rosary features the words Faith, Hope and Love. It is made with 8mm oblong white plastic beads with a silver centerpiece and crucifix. The rosary measures approximately 15.5in full length. Visit the Ignited by Truth Catholic Conference page on Facebook, then LIKE and COMMENT on the post for Divine Decades. To help us spread the word about IBT and Divine Decades, please consider sharing the post and liking the IBT page. Not on Facebook? No problem. Simply COMMENT on this post below and we’ll enter you in the drawing! Details: Winner will be selected at random on Fri, Mar 31st and announced on the IBT Facebook Page. The Rosary will be shipped (free) to the winner. The local Knights of Columbus council hosts a monthly Quarter Auction and Divine Decades is participating. Come out and meet the members behind Divine Decades and support a great Catholic cause at the same time. When: Saturday, April 8 from 6-10pm.